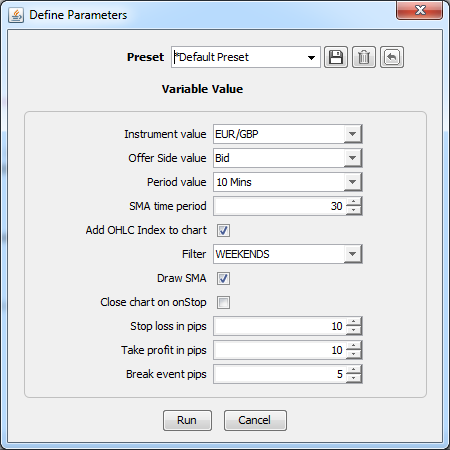 This tutorial contains information how to create and develop JForex strategies. The tutorial starts with a simple strategy which only prints a message, then proceeds to trading strategy which with each section gets more evolved as we add historical data, indicator and chart usage. Although all of the given strategies can be developed within the JForex platform, please consider the usage of an Integrated Development Environment (IDE) for strategy development. At first, we will create simple strategy by right-clicking the Strategies node in the Navigator panel and choosing New Strategy. JForex will ask you to name and save the java file on your hard drive. If you save the file with a custom filename, then don't forget to change the class' name in the generated file. The file name and class name must be the same. E.g. if we save the file as StartStrategy.java then the class name also must be StartStrategy. Compile the file by pressing F5 or compile button. Test the strategy by right-clicking the strategy in JForex and choose Local Run. The strategy parameters get set before the execution of the onStart method. Open the strategy's java file in editor and add a parameter to the java file. Read the article Strategy parameters to learn more about the strategy parameters. Compile the file. 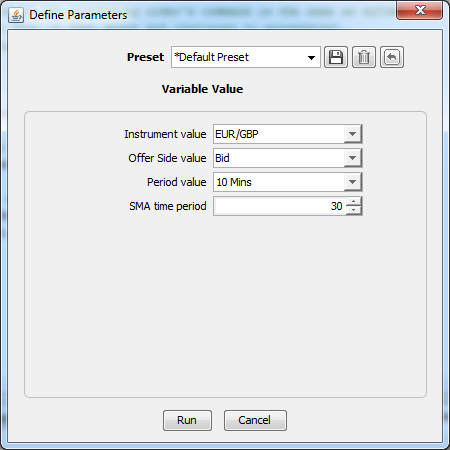 On strategy launch the "Define Parameters" dialog appears. Here one can modify the strategy parameter values. After setting the parameter values choose Run to start the strategy. 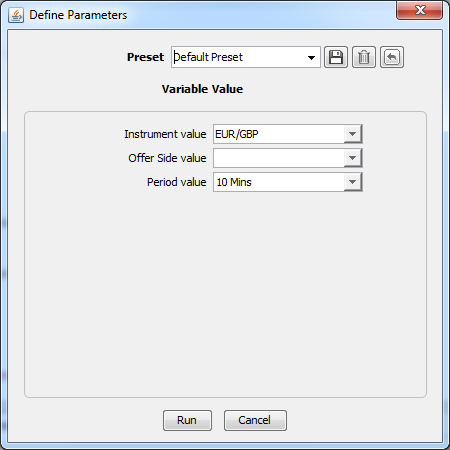 In this part of the tutorial we are using the previously defined parameters. These parameters are used to get IBar and ITick objects. One can visit History Bars or History Ticks to learn more about bars and ticks. The message in Messages tab is displayed. The message also shows the values of the parameters. The output messages from strategy are displayed in strategy's tab. Notice the open and close values of the bar. These will be required to compare chart values and bar values. Compare the strategy's output with chart output! At first write an import statement to import OrderCommand enum. This enum defines commands - SELL and BUY. We will need these enum constants later. When we now what kind of trading operation we will do, we can execute our OrderCommand by using an IEngine's method submitOrder. The submitOrder method takes as it's parameter a String object - the order label. Remember that this label for every order must be unique. Compile the file and run the strategy. Notice that in the Positions tab there is a new entry where Ext.ID equals with "MyStrategyOrder2". This is the order label which we gave as the parameter to the IEngine.submitOrder method. In this part of the tutorial we will modify previously created strategy BarsAndTicksTrade.java. The onBar method is called on every bar for every basic period and instrument that the application is subscribed on. To work with specific instruments only in onBar method, we will need to filter them out. In this example we will show how to log the order's events with an onMessage method. To log messages related to the order from all other messages, we will need to filter them out. 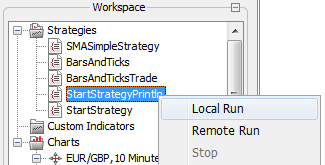 In this example we're simulating logging by simply printing out to the strategy's output tab. * Implement our business logic here. Filter specific instrument and period. * if yes then close it. Make a decision and submit a new order. One can check how the strategy works in real situations with a real historic data by using a Historical Tester. We test our strategy based upon the data of the last day. To do this, select the Tools-Historical Tester to open the historical tester's tab. Choose the strategy from a drop-down list; press the Instrument button to set the desired instrument; set the period in a drop-down list to Last day; set the period to Ticks. Finally, press the play button to start the test. If You're interested in more details how to work with Historical Tester, visit the Historical Tester's wiki. Test results opens in a browser by default. The strategy of this part of the tutorial will trade according to changes of SMA indicator - buy on up-trend and sell on down-trend. We will use a SMA (Simple Moving Average) indicator and upgrade our previously created strategy java file. The idea is to use a Indicators.sma method to get values for last two completed bars (second-to-last and last) and make a decision according to values of these bars. 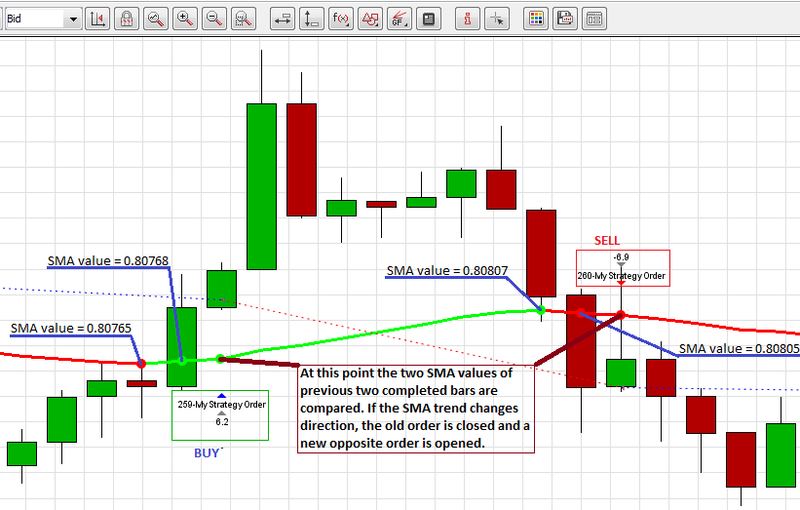 In this case we use the sma method which takes candle intervals as parameters. 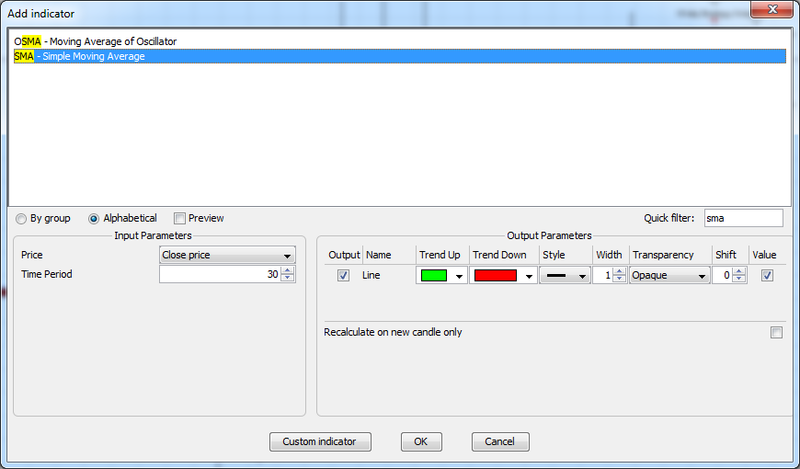 Click here to learn more how to use candle intervals for indicator calculation. *If SMA is up-trend (green line in sample picture) execute BUY order. 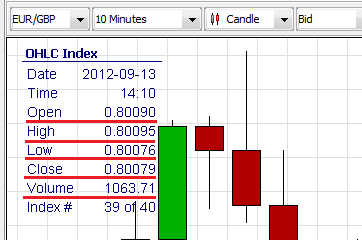 *If SMA is down-trend (red line in sample picture) execute SELL order. /*check if the order already exists. If exists, then check if the processing order's command is the same as myCommand. * If it is the same, then do nothing (let the order stay in open state and continues to processing). One can see, that the decision is made upon the two last completed bars. If a SMA trend line starts to go up then we sell, if down then buy. Check also the strategy's output - here you can see the SMA indicators for two last completed bars (last and second-to-last) and the order's messages. Click here to learn more about the Indicator Calculation. In this part of the tutorial one can learn how to add chart objects to a chart and how to customize them. We will add and customize an SMA indicator, IOhlcChartObject, ISignalDownChartObject, and ISignalUpChartObject objects. 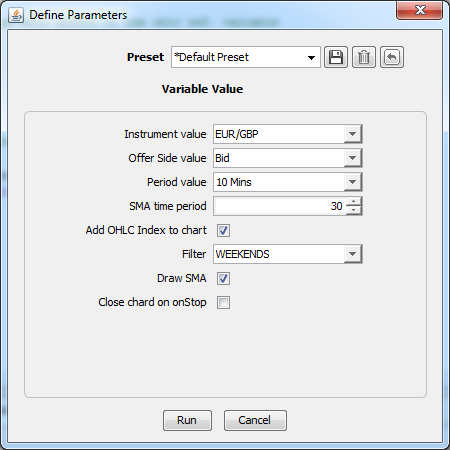 This strategy will make orders according to the SMA values and add the ISignalDownChartObject or the ISignalUpChartObject object to the chart in the point of time-line when a new order is created. We are building this new strategy upon the previously created SMASampleTrade.java file. Click here to learn more about adding objects to a chart. 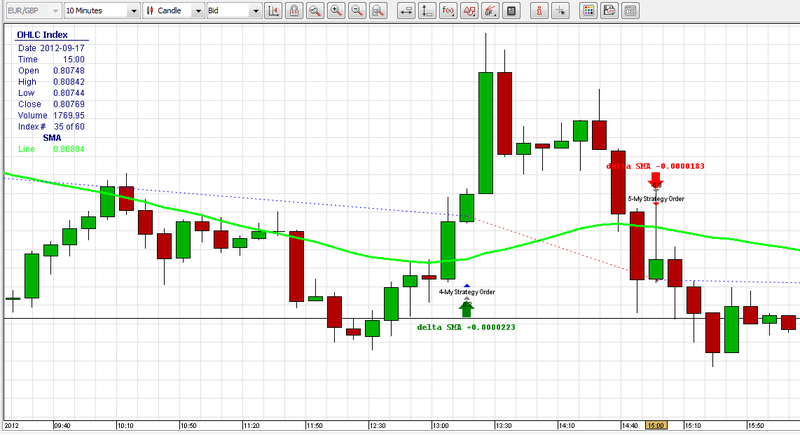 //5.Check whether the user wants to add SMA indicator to the chart. //7.we will draw an arrow when makeing an order. //So we need a time of the current bar - to get it, we add one period of a bar to a time of the last completed bar (previousBar). //8.creating a IChartObject - an up-array or down-array and add a text label to the array. //finally, add a IChartObject(array in this case) to the chart. IChartObject signal = myCommand.isLong() ? Here is the complete strategy's java file - ChartUsage.java. We begin by adding new imports and removing unnecessarily ones. Previously we assigned signal-up and signal-down objects to a IChartObject type, but now we will use another (more specific) reference type - IChartDependentChartObject. By using this kind of object one can indicate that the object will not stick to a bar when added to the chart (with IChartObject object type it is not possible). As mentioned before, we are going to use SL and TP values of an order, so we add new parameters to be able to set the necessary values at the strategy's startup. The breakEventPips variable is used to set the level of profit-pips. When this level of profit in pips is reached, the order's SL value is set to the order's open-price level. We modify our previously created onBar method. We are changing the onBar method in the way that it will use the SMATrend enum values to check when to create a new order. We are setting the SL and TP values, too. One difference from previous example is that we're not closing the previous order if a new one gets opened. The orders are closed automatically when the SL or TP values are reached. Plus, all new orders are saved in the Map for later checking in the onTick method. 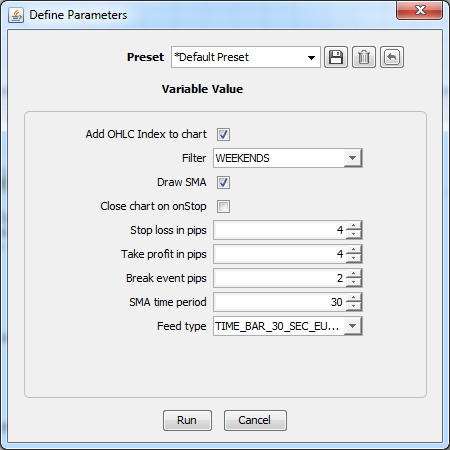 Implement the addBreakToChart method which is invoked from onTick method to show a visual representation of SL changes in the chart. In this method we are adding a triangle to our chart if the SL value is changed for an order. Green triangle represents the SL changes for long orders and red one for short orders. The triangle is drawn so that it starts when the order is created and ends when the SL value is changed. We add a text to the triangle to represent the old and new values of SL. Here is the complete strategy's java file - StopLossStrategy.java. Click here to learn more about SL. Consider the output of the chart! Red and green arrows shows the short and long orders in the chart at a time the order is created. Right-side of the triangles shows the SL change time and the new and old SL values. Triangle's left corner starts at the same position in time when the order is created - by doing so one can easy track to which order the SL change is made for. In this section we are going to change the feed data type from 10 minutes to 2-pip renko bars (and alternatively 30 second custom period bars) by leaving the remaining strategy logic the same. In order to create a strategy which works with different data feeds, one needs to create a class that implements a IFeedListener interface. This class needs to implement only one method - IFeedListener.onFeedData. This method is invoked every time the feed data arrives. In this example we are going to modify the previously created strategy java file - StopLossStrategy.java. If we are using more than one data-feed type in the code, then we need to use Instrument, OfferSide, PriceRange, Period according to a subscribed feed. All of these values can be retrieved from a IFeedDescriptor element. Replace these variables in all methods with calls of IFeedDescriptor methods which retrieve the same variables according to the feed type. So, remove the myInstrument, myOfferSide, and myPeriod parameters. In this example we will provide a choice at strategy's startup to choose between two feed types, so we are add a new parameter. We will need to detect a user's choice of feed and subscribe it. Because of this we declare a new enum. This enum has a constructor that assigns a value for a constant's IFeedDescriptor variable. By doing so we can later use the enum's (FeedType) constant to get information about a selected data feed (Instrument, OfferSide, etc.). We are moving all logic from onBar to onFeedData method. We are no more interested in to execute the onBar method since we are using data feed. We are interested in that our logic is executed every time a new data arrives. To retrieve the data we need to implement IFeedListener interface. This interface declares only one method - onFeedData. One difference from the code of previously created strategy is that the Instrument and OfferSide values are retrieved from IFeedDescriptor object. All of the code is inserted in a try-catch block, because some of the methods (e.g. IIndicators.calculateIndicator) trow JFException. The IBar object is retrieved by casting down ITimedData object (IBar interface extends ITimedData interface). A feed of indicator is also retrieved in a little bit different manner - we are using IIndicators.calculateIndicator method instead of IIndicators.sma because of the usage of IFeedDescriptor object. The complete source code of the strategy - Feeds.java. In this example we are using more specific time (30 seconds) and price (2 pips) ranges. Before launching the strategy one needs to open a chart with the same parameters as given in the strategy parameters. To add specific ranges of time/price ranges one needs to choose Tools -> Preferences -> Period and add required periods. 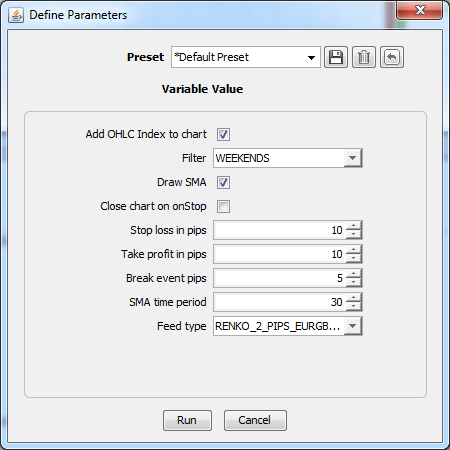 To launch the strategy you need to add Renko 2 Pips and 30 Seconds periods. In this example we are adding a GUI (Graphical User Interface) element (JDialog) which will show up a warning dialog every time a new order is submitted. The dialog will contain the message text with a label of the created order. If it happens that the new order is created before the old dialog is closed, then the dialog simply changes the new order's label in the message text. We will modify our previously created strategy - Feeds.java. At first, we're adding new imports for GUI. We are going to use a JDialog object, that will include (wraps) JOptionPane (the content of JDialog) object. Declare instance variables for the dialog. The showNotification method shows the dialog every time a new order is created (if the old dialog is closed) or modifies the message of an existing dialog (if the old dialog is not closed). If the dialog is not closed, then the method adds a logic which listens to dialog's events. In this case we are listening for window's close events. If the window of dialog gets closed then the dialogClosed variable is set to false, so at the next method's execution we will now that the dialog is in closed position. Here is the completed strategy's java file - FeedsGUI.java. One can click here to learn more of how to use JDialog and other Java™ swing objects.